Deployment is simple. Download jsMath package from its homepage together with image fonts. Unpack image fonts into a subfolder called “fonts” of the jsMath folder. 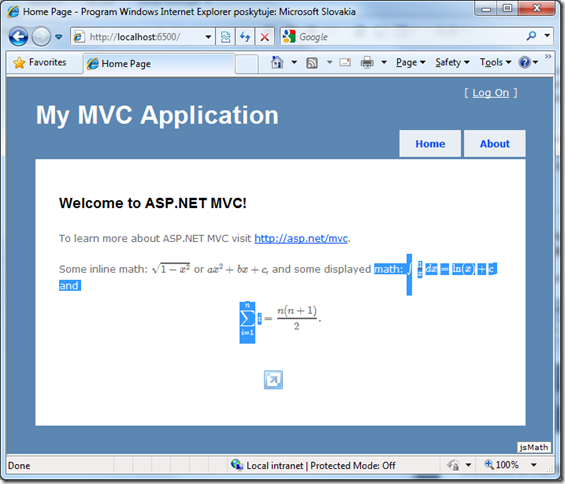 Now create a new ASP.NET web project/site and copy the jsMath folder to the root folder. Set any permanent port number in the project properties in Visual Studio because we need a fixed URL. If you wonder about the formula format, read any TeX or LaTeX manual. With releases of Firefox 3.5, Safari 3.1 and Opera 10, web developers can use a feature called font embedding. It means that we don’t need to rely only on web-safe fonts and we can use any font by using the @font-face technique. A common myth is that Internet Explorer does not support this technique. It’s false and the truth is that Internet Explorer has supported font embedding long before Firefox or Safari even existed – since IE4 (1997!). It supports, however, only one of formats specified in the CSS standard, called Embedded OpenType (.eot) but this usually is not a problem since conversion tools from TrueType exist. Now almost all your users will benefit from formulas rendered by CM fonts (at least IE, Firefox, Chrome, Safari and Opera! – that’s the vast majority). But remember. 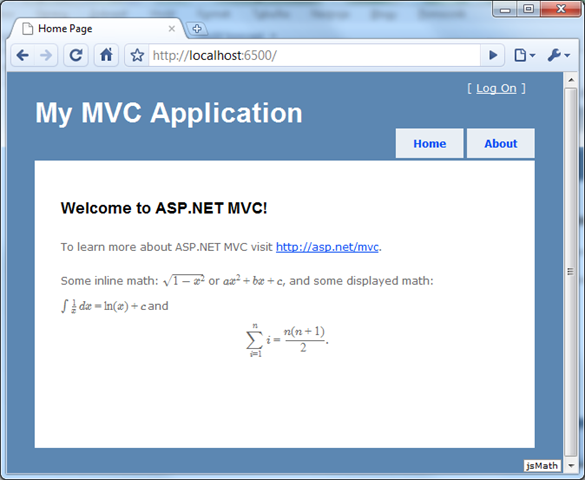 It’s all automatic and on-the-fly, you won’t even see this markup in View->Source. Note that you can’t hide it by display:none because the font won’t be loaded. Place it somewhere to your masterpage where it won’t get in the way to other content.